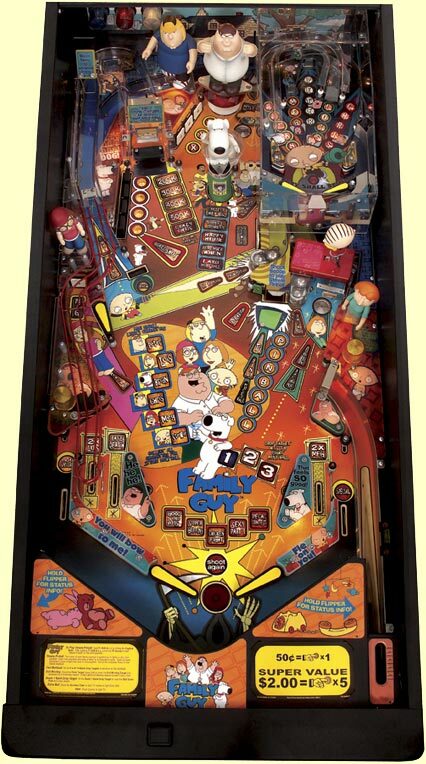 FAMILY GUY PINBALL MACHINE ! newest pinball machine, designed by Pat Lawlor and his team at Pat Lawlor Design, and the pinball imagineers at Stern Pinball! as well as famed pinball artists John Youssi and Margaret Hudson. chance of beating Stewie ! also very fun and very easy to understand for the casual pinball player. This is a great game for both home owners and arcade game operators,” said Gary Stern, President of Stern Pinball. 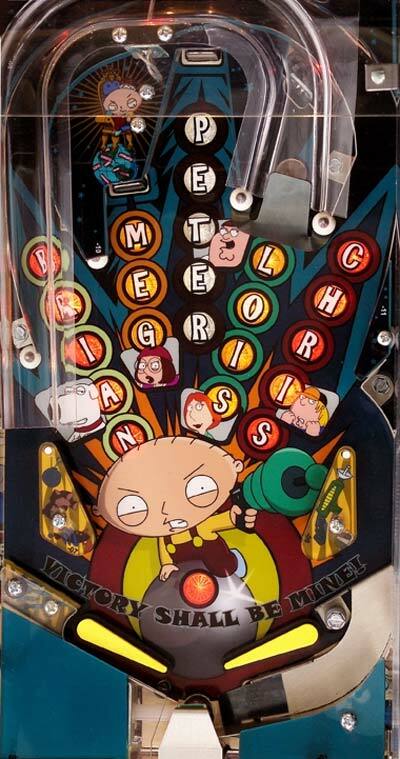 “We are always looking for fun and innovative ways to extend our FAMILY GUY merchandising program for fans and bringing this comedic brand to pinball is a natural fit". "We are delighted to work with Stern Pinball which has produced a brilliant game which stays true to the hilarious Griffin Family,” added Elie Dekel, EVP of Fox Licensing & Merchandising. Heading up the eclectic Family Guy household is Peter Griffin, a big, boisterous, lovable oaf who isn't afraid to say what's on his freakin' mind -- usually the wrong thing at exactly the wrong time. He lives in Quahog, Rhode Island with his wife, Lois, and their three children -- Chris, Meg and Stewie, a brilliant, sadistic baby bent on destroying the world. And, don’t forget Peter’s well-spoken, cynical best friend, Brian, the family dog. Executive producer/creator Seth MacFarlane has the distinction of being the youngest person to be an executive producer. Family Guy debuted after the Super Bowl in 1999, and in 2004, Family Guy made television history when Fox ordered the previously canceled show back into production due to its extraordinary fan support in both DVD sales and repeat broadcasts on Cartoon Network’s ‘Adult Swim’.